One of the niftier devices that Jimmy Moore showed us on the 2014 LCC was a breath-a-lyzer type device that would measure ketones. At the time, he wasn’t sure of the time it would make it to the market, but it has arrived, and is available for purchase via Amazon. 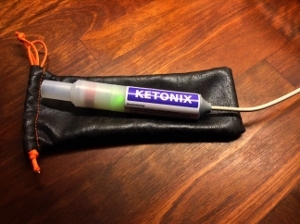 Although the ketone measured by this device differs from the one measured by the blood-test strips, the two measurements are well-enough correlated that this is a practical and useful tool for measuring your level of ketosis. The device is about $114, and can take over 1,000 measurements, making each test a tiny fraction of the cost of the blood ketone strips. Best part is, no finger-pricking needed! You plug the thing into either a USB port or a USB power adapter, and do a long, gentle exhale through it. Now, back to our regular program… I’m working on the next video, which I hope to have ready to post tomorrow. UPDATE: The price appears to be coming down a bit, making this an even better deal. This entry was posted in Fitness, Health, Low Carb Cruising!, Nutritional Research. Bookmark the permalink.